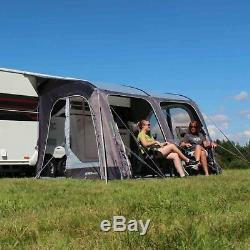 Outdoor Revolution E-Sport Air 325 Inflatable Caravan Awning (2018) (FREE Carpet & Inner Tent). 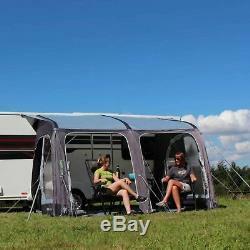 Introducing the Outdoor Revolution E-Sport Air 325 Inflatable Caravan Awning! 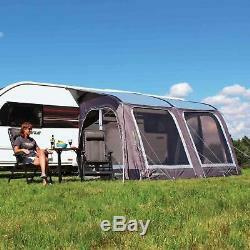 This inflatable awning is a must-have addition to your caravan. This product is an upgrade of the previous Sport Air 325 awning with much greater benefits! One of the best feature of this awning is that it can inflate in just 2 minutes, which means you can get on and enjoy your trip without any more days spent assembling poled awnings! The E-Sport Air 325 is the upgraded and improved version of the successful Sport-Air 325 in 2016 and 2017. It is even more luxurious as well as more spacious. With the ability to accommodate a zip-on annexe, both left and right fitting, this awning incorporates many innovative features, making it one of the most versatile, functional and technical lightweight awnings in its class. Newly refined for 2018; this lightweight single inflation point caravan awning really is the perfect awning. The Dura-Tech welded air-frame system, with high pressure tubes, makes this awning the fastest, most robust and reliable on the market to inflate, without any troublesome connecting hoses and valves. Outdoor Revolutions Lifetime Guarantee gives you peace of mind in years to come. In addition, the air-tubes have increased in diameter this year to improve durability and stability of the product, whilst retaining the desired benefit the ultra-fast single point inflation Oxygen Air-Frame provides. Both the E-Sport Air 325 and ¦400 are created using our 250 High Density double rip-stop endurance fabric in order to provide unequalled benefits in terms of strength to weight ratio. The innovative Double Rip Stop weave increases the strength and durability twofold, preventing tears in the fabric from spreading and causing further damage. The fabric is exceptionally water-resistant and water will simply bead onto the surface and roll-off; the light-coloured roof material reflects heat to maintain a comfortable temperature inside the awning. The versatility of the two front panels enables the doors to be opened and rolled back, creating a canopy style product, or zipped-in to increase privacy. Both side-door panels have zip-in mesh doors, helping to increase air-flow and reducing condensation, whilst keeping out those pesky crawling critters. Zip-in embossed curtains on all windows increase privacy and security, but can be zipped open and rolled back to allow daylight to flood in. The optional E-Sport Annexe can be zipped onto either side of the product and comes complete with a double micro-polyester inner tent; perfect for grandchildren or overnight guests. 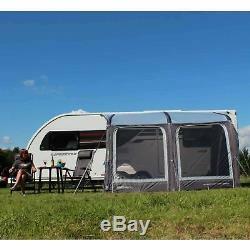 Ventilation points and mesh doors placed on each side of the awnings are strategically placed to reduce condensation; this awning is available in 3 height options (Standard) to fit caravans, plus 2 motorhome height options (L, XL). Fabric - The Ultimate Strength to Weight Ratio of any Material on the Market! Welded Single Inflation Point Tube - No-Fuss Single Inflation Point'Oxygen Air-Frame'. Dynamic Speed Valves - The Quickest ; Most Reliable Inflation Valve Available. Intelligent Frame Relief Valve Protection System - Our Patented Pressure Relief Valve to Prevent Over-Inflation, Expelling any Excess Air Above 6PSI. Internal Roof Tube Kit - Additional Air-Beams to Further Tension the Roof ; Provide Optimum Stability. Tinted Windows - To Reduce Glare and Increase Privacy. Embossed Zip-In Curtains - For an Extra Degree of Privacy ; Make It Feel More Like Home. TPS Twin Piping System (4mm x 6mm). To Attach to Your Caravan/Motorhome. Doors - Created from an Assisted-Healing'Smart' Material to Self-Repair'Snag' Damage Over Time. Lumi-Link ; Up/Down Lighter Compatible - Compatible with Our Brand-New 2018 Lighting Range. Polyester Draught Exclusion - To Maintain a Comfortable Temperature Inside the Awning. 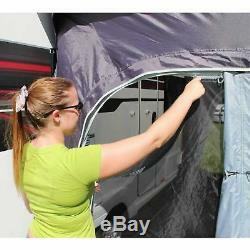 Polyester Draught Skirt - To Maintain a Comfortable Temperature Inside the Awning. For Additional Stability ; Support During Harsher Weather Conditions. Includes Pegs ; Dual Action Hand Pump ; Lumi-Link/Lumi-Lite Hanging Points. 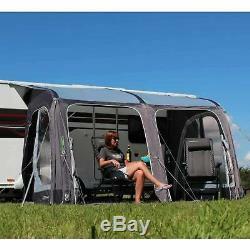 3 Height Options - To Comfortably Fit 99% of Caravans/Motorhomes on the Market! HEIGHT RANGE: 235-250cm (Standard), 250-265cm (L), 265-280cm (XL). WEIGHT: 16.1kg (Standard), 16.5kg (L), 17kg (XL). This awning has been specifically designed and is perfect for touring use; it is not designed for seasonal or residential purposes. The item "Outdoor Revolution E-Sport Air 325 Inflatable Caravan Awning + FREE Inner Tent" is in sale since Thursday, October 18, 2018. This item is in the category "Sporting Goods\Camping & Hiking\Tents & Canopies\Tent & Canopy Accessories". 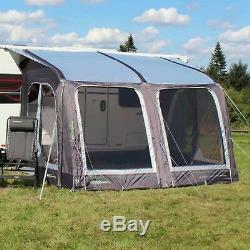 The seller is "qualitycaravanawnings" and is located in uk. This item can be shipped to United Kingdom, Austria, Belgium, Bulgaria, Croatia, Cyprus, Czech republic, Denmark, Estonia, Finland, France, Germany, Greece, Hungary, Ireland, Italy, Latvia, Lithuania, Luxembourg, Malta, Netherlands, Poland, Portugal, Romania, Slovakia, Slovenia, Spain, Sweden, Australia, United States, Canada, Brazil, Japan, New Zealand, China, Israel, Hong Kong, Norway, Malaysia, Singapore, South Korea, Switzerland, Taiwan, Thailand, Chile.